In 1989 the Conservative government realised their long-held objective of introducing a flat-rate poll tax in Britain. The abolition of the rating system had appeared as part of the party's manifesto for the 1979 general election, and the proposal for the introduction of a poll tax was made explicit in their manifesto for the 1987 election. In late 1989 the plans were adopted, with the new tax to begin in Scotland from the start of the 1989/1990 financial year, and in England from the start of the 1990/1991 financial year. In essence the poll tax meant a single flat-rate charge on everybody, meaning the tax system had ceased to take account of income or property ownership (as the rates system had), and became based on the number of people living in a house rather than its estimated price. This effectively saw the tax burden shift to the working class. The government's attitude was best summed up by Nicholas Ridley, Conservative Secretary of State for the Environment, bragging that, “A duke would pay the same as a dustman”. The introduction of the poll tax was widely unpopular from the outset, and increased when tax rates set by many local councils turned out to be much higher than initially predicted.. Local groups opposed to the tax, known as Anti-Poll-Tax Unions (APTUs), were set up throughout 1989, and by the end of the year there were an estimated one thousand in Britain. 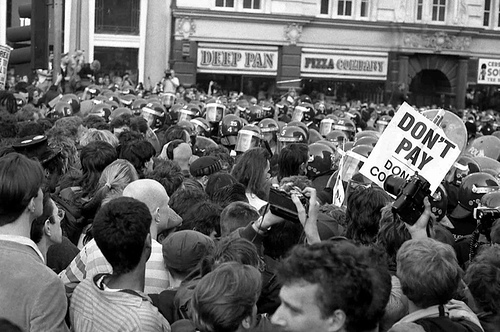 The role of APTUs in opposing the poll tax took many forms, including encouraging non-payment, organising protest marches, and resisting bailiffs. Community networks of members were set up to watch out for and resist bailiffs, and the operation became so successful that debt collecting firms in some areas went out of business. In Edinburgh local APTUs patrolled working class areas with cars and radios to watch for bailiffs, and in London some cab drivers fulfilled the same role. Baliffs offices were often picketed and occupied, and in Scotland hundreds of people defended houses against the forced removal of goods by sheriffs. The campaign for non-payment gained in strength through the early months of 1990, and eventually became the single most damaging reason for the government to continue with the poll tax. By August of 1990 one in five had yet to pay, with figures reaching up to 27% of people in London. 20 million people were summoned for non-payment. Many local authorities were faced with a crisis, and councils faced a deficit of £1.7 billion for the next year. Initial successes with non-payment campaigns led to several large demonstrations in cities across the country, including the famous disturbances that occurred in central London on March 31. On the morning of March 31 around 200,000 people gathered in Kennington Park, and by the afternoon marchers began to flow into the planned destination of Trafalgar Square. Parts of the march were cut off by police, and a large group of protesters were penned in when police blocked the top and bottom of Whitehall. After several heavy-handed arrests a series of scuffles broke out as protestors tried to break through police lines and march to Trafalgar Square. Serious rioting broke out after mounted police attacked crowds in Trafalgar Square, and several police vans were driven at demonstrators in an attempt to disperse them. Builders cabins in the square were set on fire by demonstrators, as were parts of the nearby South African High Commission. Fighting spilled out into nearby streets where numerous shops were attacked, and continued into the early morning. 5,000 were reported injured, including police officers, and 339 demonstrators were arrested. A Trafalgar Square Defendants Campaign, committed to the release of the 491 people arrested in connection with the riot, was set up in the following days, and was successful in securing the release of many. Influential in trials of defendants was the fifty hours of security camera footage acquired by the Campaign, parts of which showed police officers launching unprovoked attacks on demonstrators. The police, trade unions, the Labour Party, and a number of left groups were quick to condemn the violence, and blamed the rioting on anarchists. Despite these accusations and the willingness of some anarchists to claim responsibility, a 1991 police report into the disturbances concluded that there was, "no evidence that the trouble was orchestrated by left-wing anarchist groups". Although the march had been organised by left groups, the large number of people taking part and the sheer scale of the riot (believed to be the largest to have taken place in London in the 20th century) point to the deep discontent the poll tax evoked throughout Britain. With widespread opposition to the poll tax growing, the Conservative government was forced to abandon their plans. Margaret Thatcher resigned as Prime Minister in November of 1990, and her successor John Major immediately announced the abolition of the community charge. Although replaced with the council tax, which took account of some ability to pay, the campaign against the introduction of the poll tax had been successful. The unpopularity of the tax had been brought into sharp focus by the rioting in London, but it was through nationwide organising of resistance and the tactic of non-payment that the state had been forced to back down. With widespread opposition to the poll tax growing, the Conservative government was forced to abandon their plans. Margaret Thatcher resigned as Prime Minister in November of 1990, and her successor John Major immediately announced the abolition of the community charge. The campaign against registration greatly helped build up confidence to resist payment. In October 1988, six months before the registration deadline in Scotland, there were already 23 local groups in Edinburgh and 31 in Glasgow, so resistance started earlier that the article indicates. Use of the name APTU was resisted by libertarians in many areas as it was associated with the left, and later with the All Britain Anti-Poll Tax Federation that was setup and controlled by Militant (now Socialist Party). Also it would be good to tell the story about the antics of Militant who were prone to setting up bogus groups in neighbourhoods even when independent groups already existed, and others on the left (SWP) who initially ignored the struggle as it wasn't workplace based. Militant were against non-registration because they didn't want potential Labour voters to be taken off the electoral register (see Danny Burns 'Poll Tax Rebellion'), but this became a key part of the grassroots campaign supported by anarchists (we also had our own network called 3D, to coordinate nationally). There were 2 other proposed strategies of resistance - 'non-collection' and 'non-implementation' - but these did not really come to anything since Labour councils were bent on implementation of the so called 'Tory tax', and there were few good examples of workplace resistance to collection apart from those mentioned in the article above - that is also important I think. Sorry if this seems overly critical - I think it's really good to see articles on libcom during the 20 year anniversary of non-payment in Scotland (and non-registration in England and Wales!). Yes, thanks this is a good summary. And of an important series of events, especially for the UK, which up until now this site has been sorely lacking! It was such a huge movement that it's difficult to do it justice in 1500 words or so. Highly recommended further reading would be "poll tax rebellion" by Danny Burns, published by Ak press. This is an excellent and very detailed account of the movement from its inception to its victory and beyond. I would definitely like to see the community resistance aspects written about more, by those that were involved. As a sustained and intense organising effort by working class people, this was politically far more significant than the riot. ACF published loads in Organise! as well as two pamphlets but this is all print only (Beating the Poll Tax was scanned in). One more point. I am not sure any anarchists did ever 'claim responsibility' (which I think you took from Wikipedia saying "Some anarchists, especially the high-profile Class War organisation, were happy to take the credit"). Although Class War having a spokesperson appearing on TV was ill-advised in my opinion (especially as politicians were looking for someone to blame, plus the person concerned got victimised at work) he did say, in my recollection, that they couldn't possibly have organised it considering their numbers, that it was the people that did it and that they were "working class heroes". That's not claiming responsibility, nor even taking credit. Maybe someone will find a recording and put it on YouTube one day (think it was BBC with Paxman interviewing). And the one of Ian Bone on Jonathan Ross Show. Nice one Alex, your article made those heady (and abnormally warm) days of March 1990 come flooding back to my now greying and wrinkly head! I just wanted to add a couple of things from my (now distant and dotage) recollection; personally I feel the Prison Uprisings of April - June 1990 played a vital role in the non-payment movement and in defeating the Poll Tax, I think its easy to forget just how utterly awful the Poll tax legislation was, I remember droves of ermine-robed hereditary Lords being chauffered into Westminster to ensure a majority for the Act, (and if 'class war' was responsible for the riots then it was that class war against us! ) The Act was clinically cruel, it exempted no-one (except members of the SAS) and at first there was no such thing as 'poll tax benefit' for the unemployed, they had to pay up like everyone else, of course the backbone of the non-payment movement was the 'couldn't-pay-if-I-wanted-to' movement, but the Act was clear, if you couldn't pay or didn't pay you would go to jail, I can't describe how frightened people I knew were about this threat, it seemed real and imminent, so the fact prisoners set fire to all the prisons on 1 April came as a liberation! At a recent event at The Sparrows' Nest in Nottingham we showed this footage! It was well attended by veterans of the campaign.